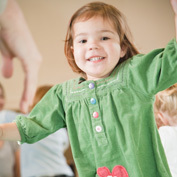 The aim is to foster a love of music and movement through activities, wonderful props and very carefully selected nursery rhymes, number songs & action songs. Repetition is fundamental to children’s learning, therefore the music & songs run in 4 to 6 week cycles to ensure everyone benefits from repeating the same songs & has a real chance to learn. Following the same pattern of activities each week really helps the children to feel secure and this builds confidence which in turn enables them to join in more actively & independently.